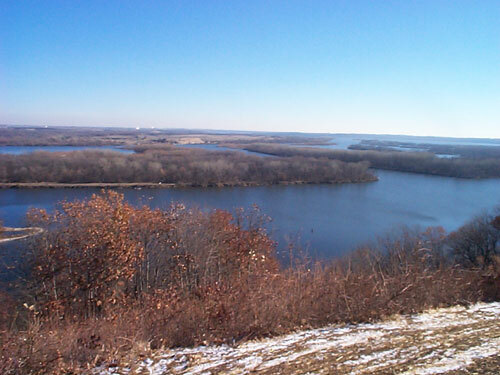 In 2002, a new Department of Natural Resources Scientific and Natural Area (SNA) was established along the Pine Bend Bluffs overlooking the Mississippi River in Inver Grove Heights, Minnesota. While the SNA was established with the purchase of 160 acres, Friends of the Mississippi River has continued to reach out to other landowners in the area, leading to the addition of new land to the SNA. FMR has also taken the lead in natural resources management of portions of the SNA through funds donated by the late Dwight Malcolm, whose land became a portion of the SNA. Located between Highway 52 and the Mississippi River in Inver Grove Heights, the natural area consists of 248 acres of wooded hillsides, wetlands, and prairie openings. The origin of the SNA was a fifty-acre portion that was sold to the Minnesota DNR by Dwight Malcolm. Before he died of cancer in 2001, Malcolm made it clear that he wanted future generations to be able to experience the same natural beauty he and his sister had enjoyed, and he committed a portion of his proceeds from the sale to create a fund for natural resources management on the new SNA. 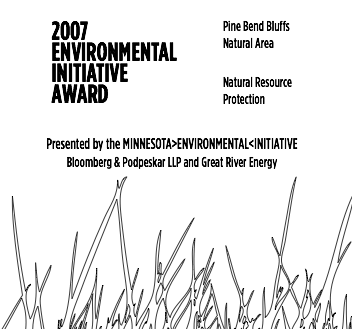 In February of 2003, FMR staff organized a meeting between two owners of land in the Pine Bend Bluffs area and the DNR  a discussion which led to the purchase of an additional 16 acres from one land owner for the SNA. This purchase was a joint effort between the Trust for Public Land and the DNR. And a couple years later, the other landowner at that meeting sold 31.5 acres to the DNR, by way of the Trust for Public Land. This parcel, too, has been added to the SNA. 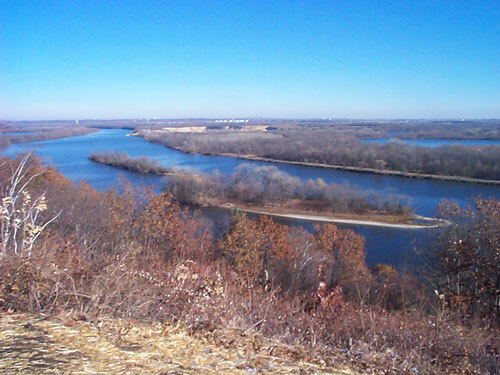 The Pine Bend Bluffs SNA offers stunning views of the Mississippi River. The establishment of the new SNA culminated years of work by FMR, the Trust for Public Land, the Minnesota DNR and a regional coalition of open space advocates. The land that became the SNA was one of the high priority natural areas identified by Dakota County in its Farmland and Natural Areas Protection Plan developed in 2001. The Minnesota DNRs Metro Greenways program, established to protect key open space and natural areas in the Twin Cities Metropolitan Region, provided the critical funding necessary to acquire the property. The Trust for Public Land helped to identify an overall protection strategy for the site, facilitated the real estate and legal issues pertaining to acquisition of some of the property, provided $50,000 for the purchase and assisted in communicating the vision for fundraising efforts. Both TPL and FMR advised the citizen-led successful Dakota County Farmland and Natural Area referendum. The City of Inver Grove Heights, Dakota County, and the Metropolitan Council also provided funding. 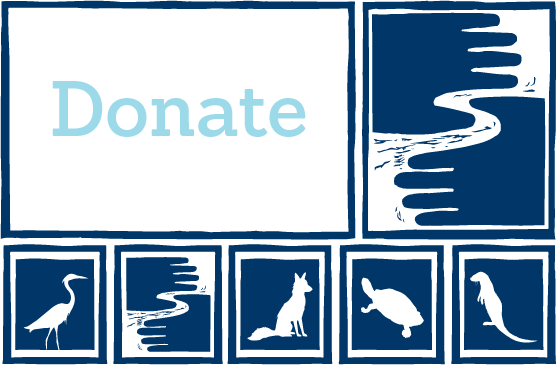 Friends of the Mississippi River played a critical role in identifying and cultivating landowner interest in the project, presenting landowners with conservation options and helping to generate funding through grants and other outreach. The Malcolm estate created a trust fund that provides FMR with ongoing funding to continue natural resource management activities on the SNA. A caring steward of the environment, Dwight Malcolm not only ensured long-term protection of this special property through helping establish the Pine Bend Bluffs SNA, but also dedicated funds for management and restoration. In cooperation with the DNR, FMR completed a management plan for the Malcolm property and conducts ongoing management and restoration activities. The top priority is to reduce exotic invasive plants (especially buckthorn and garlic mustard) from the high quality dry oak forest which covers about 26 acres of the site. No rare plants have been located at the site, but kittentails (Besseya bullii), a state threatened species, have been found in nearby areas. Former savanna areas will also restored at the existing eleven-acre old field portion of the property. Volunteers have helped collect seed from two nearby natural prairie sites. The oak savanna will be restored gradually as adequate seed is obtained. Only local seed will be used because the intent is to restore the plant community that was here at the time of European settlement. Check out the summary and photos from a restoration event that took place in April, 2005. These photos, taken from the bluffs overlooking the Mississippi River from the west, show the stunning views one can find at the Pine Bend Bluffs SNA. 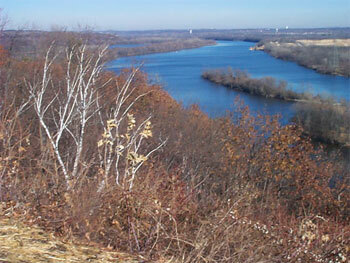 Looking upstream at the Mississippi River from the Pine Bend Bluffs SNA.